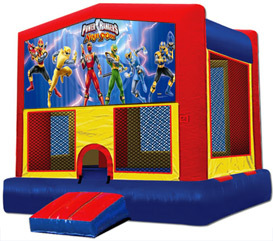 We from BounceHousesForRent.com will provide you with this new and clean Power Rangers Theme Jumper. Our price includes delivery, setup, and pickup within our delivery area. We serve parts of Los Angeles County and Orange County, California. Kids loved it. Easy order and good experience. Thanks! Prompt and reliable delivery and pick up service. I would definately recommend to others and use again. Jumper was in great condition. I absolutely love Go Jumper . The Power Ranger jumper was really big and clean . The delivery drivers were prompt friendly and professional. I will always use Go Jumper for my party needs. Reserved online, drop off and pick up went smoothly, and most importantly, the kids loved it!